I’m sorry the photo of the stew makes it look a little sloppy but I was in a hurry to take the photo and eat. I didn’t clean the sides of the pot as I should have. But this is a great recipe from “The Flavors of Country Cooking” by Country Living. I am a fool for slow cooked beef. This recipe features it perfectly. Please do take the time to make this on a weekend because it needs at least 2 ½ hours to cook but is so worth it. And don’t rush the browning process for the beef or venison. That is where you start to build up the layers of flavor in the pot and when you deglaze with the red wine all of the browned bits sticking to the bottom of the pot is released in all of its great tasting glory. Preheat oven to 325 degrees F. In a large Dutch Oven preferably cast iron, cook bacon until browned. Remove from pot and drain on paper towels and crumble. Set aside. Pour off half of the bacon grease and reserve. Place the flour in a gallon baggie. In batched toss the beef cubes in the flour until well coated. Add meat in batches to the pot and cook until well browned. Don’t rush this step. It will pay off later with huge flavor. Place all browned beef in a large bowl, add in the bacon and bacon fat mix. In the pot add the onions, and sauté until golden brown for about 5 minutes. Add garlic and cook for about 2 minutes. Be careful not to burn the garlic. It will turn bitter. Remove the onion mix from the pot and mix with the beef. Turn the heat up to high for about 1 -2 minutes. Add the red wine. The pot will sizzle. Keep stirring to get the browned bits off the bottom of the pot. Reduce heat and add all remaining ingredients. Stir. Place in oven and cook for at least 2 ½ hours. Serve over noodles or by itself with garlic bread. Enjoy! 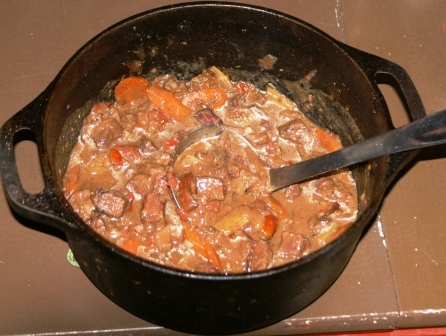 This entry was posted in cast iron cookery, main dish, stew and tagged beef, bison, cab sauv, french comfort food, garlic, merlot, onions, pinot nior, red wine, venison. Bookmark the permalink.